The magazine of Dutch magazines - and regarding design The Magazine - has its new issue out. An in depth interview with Joe Moscheo on (the Dutch translation of) his book is the starter. Furthermore there are tons of news (for those that are not on the internet), reviews of CDs, books and DVDs and a short interview with Henrik Knudsen on his danish Graceland project. 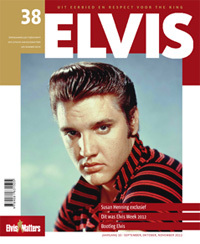 It is about time that this magazine gets an English version, making it possible for the rest of the Elvis (fan)world to enjoy it too! I got this ""masterpiece" Magazine this morning. this is truly a fantastic awesome Magazine, wonderful pictures, great articles!! i'm going to stay a member of this fanclub forever!! great fanclub!!! And again.... this is a real masterpiece!! Excellent articles and photos, and they really KNOW what they are talking about. Hand up for EM !